The Buffalo Zoo is inviting people to vote online for one of three names for an infant male gorilla born on Sunday, January 10 to mother, 18-year-old Sydney, and father, 28-year-old Koga. The Zoo’s gorilla keepers determined that the infant is a boy and narrowed a universe of possible names down to three choices. To vote visit https://www.surveymonkey.com/r/zoogorilla, or the Zoo’s Facebook page. The winning name will be announced during their “APEril Zooper” Saturday event on April 2, 2016. 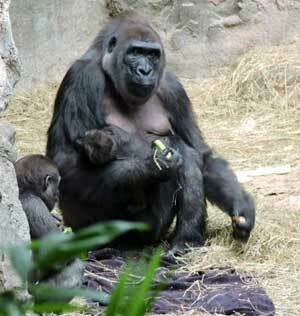 People can see the infant gorilla along with the rest of the troop daily in the Zoo’s gorilla house.